So several years ago my friend Blake was on tour with Rascal Flatts, he was in charge of all the social media stuff on the tour. So Jamie and I go and stand in line with the rest of the meet and greet people, we are talking and having a great time. I keep thinking to myself: 'This can't be real.' Then all of the sudden this guy appears out of no where and says to me and Jamie, 'Hey you all are not supposed to be here.' I was like 'what?' He said 'Come with me.' So we follow this guy around the corner (thinking we are getting kicked out.) He takes us around the corner through a set of doors to another room where we are greeted and welcomed into a room full of food, beverages, and music...they said 'This is where you wait this is our VIP room.' SHUT UP!!!!!!!!!!!!! Are you serious!!!??!!??? This night just went from amazing to off the chain EPIC! So we are eating amazing food, drinking good beverages...and then all of the sudden they called us up and said 'It's your time to meet the guys.' 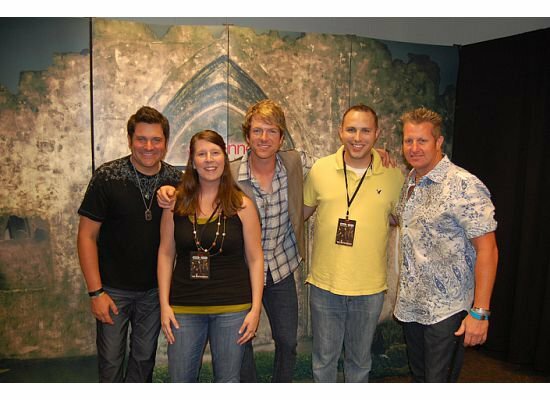 So we walked in and got to meet and talk with the guys from Rascal Flatts...really nice guys. So now, we are ushered out of the room and got to sit right next to the stage and watch the show....amazing show...I called Blake, and he said 'go down to the front of the stage.' So I walked down again and security greets me and says 'You can't be down here. You need to leave.' Then all of the sudden I hear Blake "They are with me.' The security guard says 'oh, cool...come on over the barrier guys.' I hugged Blake again...and we went and walked around back stage again...and he said 'you wanna go hang out on one of the buses with me?!' Jamie and I both yelped out 'YES!" So we went and hung out on the bus and talked for a bit. The evening was winding down...we hugged Blake and thanked him for an awesome experience. Jamie and I drove home on cloud nine that night.. I got to thinking about this experience. I got all of that, not because of what I had done, but rather because of who I knew! I had a friend on the inside! So because of that I had all access! This is just like how our relationship with Jesus is! We gain access to heaven, grace, mercy and Jesus Christ not because of what we've done, but rather because of who we know, and really more importantly, who knows us! Because of this amazing fact we REJOICE in the HOPE of the Glory of God! Knowing Jesus is the best thing you'll ever experience!